While the dissolutions stage is essentially the end of the world, a stage commonly associated with doom, pain, suffering, judgement, death and indeed extinction, it is more accurate to say it is the disappearance of the world only, not its annihilation. However, Campbell acknowledges the fear inherent in the myths of the cosmogonic round: “Creation myths are pervaded with a sense of the doom that is continually recalling all created shapes to the imperishable out of which they first emerged. The forms go forth powerfully, but inevitably reach their apogee, break, and return. Mythology, in this sense, is tragic in its view.” Here Campbell points out all creation myths underline that the birth of life likewise births death. All things, all forms, all animals, all plants, all individuals, people, cities and civilizations are doomed to death from the moment of their creation. As the hero’s journey teaches us that nothing lasts and all forms are constantly becoming and in flux, so all visible forms in the world – including the world itself – change, distort, break, and disappear. Life, in a sense, is a parade of tragedies, one following the next. The sense of the Buddha’s compassion (or, the Bodhisattva’s – this is Gautama Buddha and anyone who seeks enlightenment), is quite different from that of divesting the world of pain, it is rather “benevolence without purpose.” As Campbell recalls, “It is said that ambrosia pours from the Bodhisattva’s fingertips even to the deepest pits of Hell, giving comfort there to the souls still locked in the torture chambers of their passions.” This is the compassion of Nirvana, realizing that “in all our dealings with each other we are [the Bodhisattva’s] agents, whether knowingly or not.” It is recognizing that all beings are to some extent or another trapped in their own ego perspectives, and being willing to practice empathy towards them (and yourself), allowing through a small ray of the transcendent’s light, regardless of their outward actions and appearance. Indeed, the only answer to tragedy is in “dissolving the organ of suffering itself,” which Campbell describes as “the idea of an ego to be preserved, committed to its own compelling concepts of what is good and what is evil, true and false, right and wrong,” as, anyway, all dichotomies “are dissolved in the metaphysical impulse of compassion” as well as in the full light of the eternal, of which compassion is its earthly expression. This is what Campbell means when he describes those fixed on the problems of the world as “barred from even the outer gate of the mansion of God’s peace,” for peace is not in the world. The world was created and is maintained by the perspective of the ego, the “mansion of God’s peace” is found by reorienting our identification to the eternal. Finding the still centre within, the umbilical cord which reaches back to the unmanifest source, is the foundation of true peace. 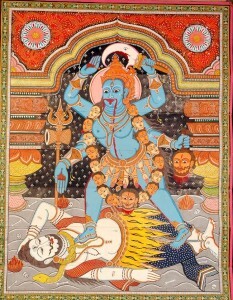 As Campbell suggests, the highest goal of mythology is to teach us how to “participate joyfully in the sorrows of the world.” As mythology underlines the tragic and painful experiences of life, it also calls us passed them, it does not judge or condemn, it invites us to acknowledge pain and “participate joyfully” all the same. Thus we are called to look upon the dissolution of the world and instead of suffering and death, to see the immanent divinity in all things. The myths about the end of the world are terrifying only because they are sublime, because our egos are forced to face the truth: “I may not be real.” These myths are filled with horrors, in fact, in order to shatter the ego, expand our perspectives and help us re-identify with the transcendent. If we could truly learn to “participate joyfully in the sorrows of the world” by understanding that the sorrows are only shadows which disappear in the light of the unmanifest, we could discover the true freedom to live. From the perspective of eternity, there is no trace of “evil” here, only a shadow play, which taken too seriously is precisely the villain’s mistake. Tragedy and sorrow are themselves only visions created by the ego, not reality, and so too is the emanation and dissolution of the world simply a perspective. In many of the world’s mythologies the true nature of death – that it is simply the release of the ego – is underlined in traditions where the individual does not die once, but countless times over, experiencing many lives, all with the same goal: to totally re-identify with the unmanifest. Death is not an end, but a gateway to the Reality behind the world. Campbell summarizes this belief: “The Chinese tell of a crossing of the Fairy Bridge under guidance of the Jade Maiden and the Golden Youth. 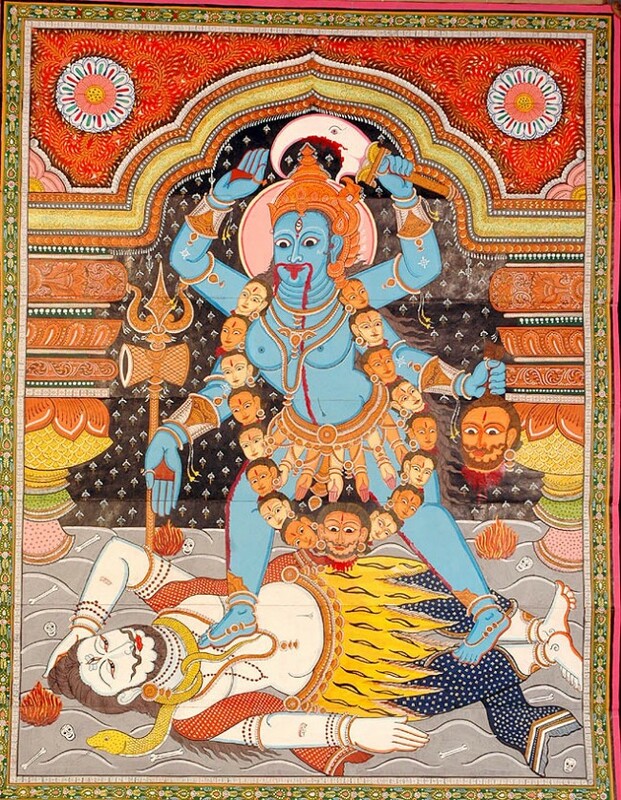 The Hindus picture a towering firmament of heavens and a many-leveled underworld of hells. The soul gravitates after death to the story appropriate to its relative density, there to digest and assimilate the whole meaning of its past life. When the lesson has been learned, it returns to the world, to prepare itself for the next degree of experience. Thus gradually it makes its way through all the levels of life-value until it has broken past the confines of the cosmic egg. Dante’s Divina Commedia is an exhaustive review of the stages: “Inferno,” the misery of the spirit bound to the prides and actions of the flesh; “Purgatorio,” the process of transmuting fleshly into spiritual experience; “Paradiso,” the degrees of spiritual realization.” Each life’s aim is to become more transparent to the transcendent until finally one breaks through the shadows of the world, back into Oneness. So it is that the end of the world is not the sudden implosion and annihilation of all living creatures and the earth itself, but the gradual release of all the ego perspectives which make the world real, until the universe itself is released back into formless eternity. Campbell describes this process, through the lens of the Buddhist tradition, as the gradual recognition of the illusion of separation: “As in the much later Buddhist image of the Bodhisattva within whose nimbus stand five hundred transformed Buddhas, each attended by five hundred Bodhisattvas, and each of these, in turn, by innumerable gods, so here, the soul comes to the fullness of its stature and power through assimilating the deities that formerly had been thought to be separate from and outside of it. They are projections of its own being; and as it returns to its true state they are all reassumed.” This is, essentially, the moment of apotheosis (see The Hero’s Journey), there is no longer duality, no longer separation. This is the true moment of dissolution, where all individuality, all separation, dissolves back into Oneness. And yet… there is another secret whisper behind all the tales of the world’s dissolution: another world will arise again, for nothing is every truly lost. A promise reflected, too, in many of the world’s hero myths, wherein the tales of Baldr, Jesus, and King Arthur, although they die tragically, are not lost to us forever but are hidden in sleep to return in our need. This, for Campbell, is everything: “The basic principle of all mythology is this of the beginning in the end.” So the world must end, but it must also go on. The horrifying myths of the world’s doom only appear malignant in the last throes of the ego-self resisting its own disintegration. Yet it is this ego-self, the source of our individual (and therefore false) identities, which must be let go of in order to be “reassumed.” This in, in fact, the central riddle of all mythology: “Can the ego put itself to death?” It is out of this riddle that the heroes of myth arise, the impulse to trace the path towards the ego’s release, ultimately towards the world’s dissolution where the ego perspective disappears altogether. Typically this process, particularly in the Christian tradition, is framed as the final punishment for the great sins of the world: the apocalypse becomes the ultimate redemption of a fallen, evil world. While this version rings true from the point of view that the world’s end does indeed dissolve all apparent evil, the essential meaning of these myths is that evil was never real. The true meaning of the dissolution of the universe is rather to reopen our eyes to our true identity in the divine source, and therein, as Campbell consoles in The Hero’s Journey (a transcript of several conversations with students), the concept of redemption is transformed: “The eternal cannot change. It’s not touched by time. As soon as you have a historical act, a movement, you’re in time. The world of time is a reflex of the energy of what is eternal. But the eternal is not touched by what is here. So the whole doctrine of sin is a false doctrine. It has to do with time. Your eternal character is not touched. You are redeemed.” And always have been. I never realized, until I read your summation of the cosmogonic cycle, just how Buddhist it is. Of course, I know that Campbell was well versed in Buddhism and it influenced a lot of his thinking, but after reading this, it almost seems as if this life cycle of emanation and dissolution is almost just a re-statement of Buddhism(and Hinduism). I would love to have some input from others to see to what extent they agree. Again, your grasp of Campbell’s thinking is astounding.